Every other summer, the life of a soccer fan can be rather boring. With no World Cup or European Championships to look forward to, all we enthusiastic fans have to look forward to is the summer’s transfer fodder (And boy, did this summer’s transfer season get off to a crazy start!). But as far as getting to watch high quality matches, the summers between the major tournaments can pretty much be a metaphorical desert. Sure, here in the States we have MLS (I’m not even going to mention WPS). But let’s be honest, it’s not exactly “world class” football. And normally, the Confederations Cup wouldn’t even be a blip on my radar in an off summer. In the past, quality teams have declined to play or at least haven’t sent full strength squads. The US broadcasters typically ignore the tournament. Hell, our national team has had a hard time even making the guest list. So one could hardly blame me for not really being interested. But this year it’s been a different story. The top teams all turned up with full strength rosters, with some experimental additions of course. ESPN has shown every single match so far, keeping my DVR busy the last few weeks. And the US sent a squad with some promise (or so we thought; more on this later). The matches have even been entertaining. Yesterday, my fiancée and I went down to a local bar to watch the US-Egypt and Brazil-Italy games simultaneously on side my side televisions. With the US side needing a miracle to advance, we figured we could at least the watch the ship go down in flames while enjoying a match of the titans the next screen over. I won’t go into details about the results, other than the necessary miracle happened and the USMNT somehow found their way into the semifinals. Up until the Egypt game, the US team had been nothing short of awful. I was emberassed to have thought before the tournament that they could even perform decently well. To even think that the USSF’s long term plan to become a legitimate threat to win this next World Cup (Project 2010) was possible… well, I want some of whatever they were on at the time they dreamed up the plan. In South Africa, the USMNT was on course to finish dead last in the group. Dempsey, Altidore, Ricardo Clark and in particular Beasley all looked like amateurs, or at least disinterested. 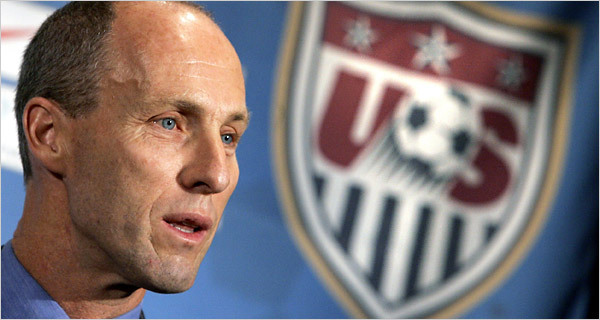 Bob Bradley made poor selections and failed to make adequate in-game adjustments, which has become a ongoing issue for the manager. We deserved to finish last. And we still should have. Then the Egypt win came, and Italy did us a favor by aging 100 years before the Brazil match (it’s about time some of those fossils played that way, otherwise Lippi would be picking the same team that won the 2006 WC for next summer’s squad). Egypt did us a favor, too, by leaving Mido at home and making sure that Zaki and Zidan were laid up with injuries. And yet despite all of that — and very suddenly, I might add — the pundits are screaming that Bob Bradley saved us. Problem is, he didn’t. Bob helped to put us in the bad situation to begin with. I’m certainly not the first person to make this assertions, and I’m sure I won’t be the last. But I feel like the case for the dismissal of Bob Bradley needs to be heard. I had even hoped that our failure to advance out of our group this summer would have been the catalyst to set his firing in motion… damn miracles. Home Record of 18-2-2 (+34): Nothing overly disturbing here… we should win at home. Away/Neutral Site Record of 7-9-1 (+2): This is the first place I felt the “uh oh, I thought something seemed fishy” feeling. While I know that we shouldn’t do near as well on the road, we should be able to tie teams like Trinidad & Tobago on the road… not lose 1-2. And the only reason we have a positive goal differential is because we had an 8-0 blow out over Barbados in 2008 World Cup Qualifying. Versus FIFA Top Sides Record of 50 9-10-1 (even): Again, disturbing. Especially when we are usually in the top 20 ourselves. Versus FIFA Top 25 Record of 4-7-1 (-9): These are World Cup-calibre teams, and we are terrible against them. 75% of our wins in this category are against Mexico, and unfortunately we won’t be playing them in every game in next year’s tournament. You have to consider that a majority of our wins in Bradley’s time at the helm have come in the Gold Cup or qualifiers against our tiny CONCACAF neighbors. In major competitions like the 2007 Copa America and the 2009 Confedrations Cup, we’re a combined 1-5 (soon to be 1-6 after we play Spain). We still struggle to score from the run of play. Bradley continues to call up DaMarcus Beasley, who I’m pretty sure has forgotten how to play soccer. He doesn’t ever see that we defend too far back in our defensive third, allowing teams like Brazil, Argentina and Italy to easily produce numerous chances. Creative players like Francisco Torres continue to ride the pine or — like Chris Rolfe — don’t even get a chance to play in meaningful friendlies. He lacks creativity with his game plans. That’s not to mention he looks like a zombie with a severe case of ADD. Look, I know it’s not all Bob’s fault. Some of our more talented players are wasting away on their club teams’ benches (Beasely, Eddie Johnson, Alitodore, Maruice Edu) and aren’t developing or getting quality minutes. Some quality players are injured (Bocanegra, Ching). And some players aren’t challenging themselves or playing to their full potential (Donovan, Twellman, Altidore). But I think Bob Bradley has failed to realize how to get the most out the most of what he has at his disposal. I’m sorry, Mr. Bradley. Your a good coach, just not at this level. Come on Sunil: it’s time to realize that you made a mistake. Go out and get Jürgen Klinsmann, pay him what he wants and let him have the control he wants. He’s sitting in the backyard of Home Depot Center for Pete’s sake — whoever the hell Pete is). Time is running out before the main even in South Africa next summer, and there is a lot we need to settle before we get embarrassed on the world stage again.